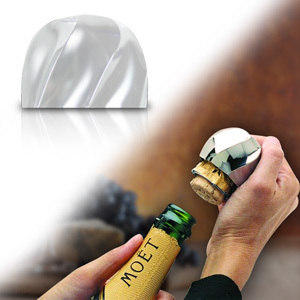 Finally, a foolproof, safe, and elegant way to open a champagne bottle. The Perfect Pop Champagne Opener quickly and easily removes the foil, cork and wire cage all at the same time. Simply place the opener over top, loosen the wire cage, twist, and pull - the cork comes out with ease, and without the possibility of injuring someone or something nearby. Its patented design has no moving parts and is constructed of high quality materials so it will last for years to come. The Perfect Pop Champagne Opener makes a great gift idea, perfect for holidays, wedding or shower gift, or as an anniversary present.